While earwigs can be considered in some ways a beneficial part of the garden, they can become a nuisance because of their diet. Since they prefer cool, moist places, a rolled up damp newspaper placed where earwig activity is suspected can be effective in collecting them. The newspaper can then either be discarded or shaken out. Placing diatomaceous earth in key spots around the home (bathroom, baseboards, window frames) can be a long-term repellent. Another method of removing earwigs is by utilizing their attraction to vegetable oil. Putting vegetable oil in a pie tin and burying it up to the rim of the tin is an effective way of capturing them. 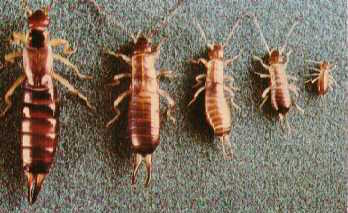 Another effective method of earwig control is to take steps to control the population before they hatch. By removing rotting underbrush and spraying with commercially available insecticidal nematodes, which invade the earwigs in their nymphal stage and infect them with a lethal bacteria.